November 23 - Saint Columban, Abbot – Optional Memorial - My Catholic Life! 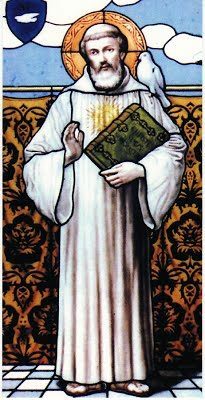 ST. COLUMBA, the apostle of the Picts, was born of a noble family, at Gartan, in the county of Tyrconnel, Ireland, in 521. From early childhood he gave himself to God. In all his labors — and they were many — his chief thought was heaven and how he should secure the way thither. The result was that he lay on the bare floor, with a stone for his pillow, and fasted all the year round; yet the sweetness of his countenance told of the holy soul’s interior serenity. Though austere, he was not morose; and, often as he longed to die, he was untiring in good works, throughout his life. After he had been made abbot, his zeal offended King Dermot; and in 565 the Saint departed for Scotland, where he founded a hundred religious houses and converted the Picts, who in gratitude gave him the island of Iona. There St. Columba founded his celebrated monastery, the school of apostolic missionaries and martyrs, and for centuries the last resting-place of Saints and kings. Four years before his death, our Saint had a vision of angels, who told him that the day of his death had been deferred four years, in answer to the prayers of his children; whereat the Saint wept bitterly, and cried out, “Woe is me that my sojourning is prolonged!” for he desired above all things to reach his true home. How different is the conduct of most men, who dread death above everything, instead of wishing “to be dissolved, and to be with Christ”! On the day of his peaceful death, in the seventy-seventh year of his age, surrounded in choir by his spiritual children, the 9th of June, 597, he said to his disciple Diermit, “This day is called the Sabbath, that is, the day of rest, and such will it truly be to me; for it will put an end to my labors.” Then, kneeling before the altar, he received the Viaticum, and sweetly slept in the Lord. His relics were carried to Down, and laid in the same shrine with the bodies of St. Patrick and St. Brigid. Reflection.— The thought of the world to come will always make us happy, and yet strict with ourselves in all our duties. The more perfect we become, the sooner shall we behold that for which St. Columba sighed.